The Chronologic time and attendance system has been designed for businesses who need more than a simple clocking system. Manufacturer Bott Ltd was expanding rapidly and required an efficient attendance system to manage the availability, sickness, holidays and banked hours of 458 employees. SafeGuard Glazing Supplies came to us because they needed to manage complex pay rules and a 4,4,5 payroll run for 88 employees working on two sites and remotely. The Centurion Hotel wanted a more sophisticated but easy-to-use system for scheduling 90 employees. Our attendance software collects the clocking records from all the clocking sources (clocking terminals, web, phone). Timed clocking downloads can be set to run at any period down to 5 seconds, giving real time information on employee clockings. When an employee’s clocking data has been collected the system automatically processes the information into net hours, applying shifts and other calculations that you’ve specified. The Exceptions Module is then used to manage clocking anomalies such as missed clockings, worked unauthorised overtime, etc. Payroll export options include, direct to Sage payroll, Pegasus, Earnie, Opera, Iris and Qtac, (as well as Excel and .csv formats). 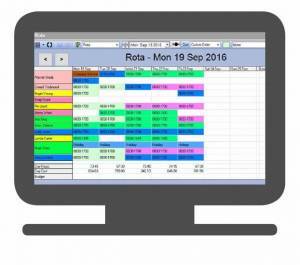 Timesheets are viewed and managed on one timesheet screen where it’s easy to see in real time which shifts have been worked, the breakdown of hours accrued, including unauthorised overtime, shift allowances, hour and money bonuses paid, etc. Editing can be restricted to specific users. Changes made are recorded in the audit log together with the time and date of the change and the ‘before-and-after’ status. Add or edit clocking times. Add, edit or delete hours worked. Change the calculations to be applied for each individual employees’ work patterns. Research suggests that employees who are able to take advantage of flexible working, which includes banked hours, TOIL/lieu time, part-time, flexitime, staggered or compressed hours can be more productive and engaged. Managing flexible working especially for large numbers of employees can be time consuming. The Chronologic attendance management system makes it easy to see exactly what’s been worked and time owed or owing, to ensure accurate pay. The attendance system gives access to individual and group holiday and absence calendars – more efficient than using spreadsheets to juggle holiday requests. The workforce availability report shows you exactly who’s due to be in work and who isn’t which makes workforce planning and scheduling simpler. At the employee level, the calendar provides managers with an overview of holidays and absences taken and booked, days scheduled to work and an analysis of absences. Employee Self-Service enables employees to view and request holidays and other absence such as sickness online which managers can then approve, saving valuable admin time. Our time and attendance system isn’t a one-size-fits-all scheduling solution, it’s very flexible. You may have quite simple requirements when Work Schedule is all you need, or you can choose Rotas for more complex patterns. Work Schedule is for organisations with employees following predictable, repeating work patterns such as one-off, continentals, triples and double days. Rotas work for organisations with more flexible working patterns. Shifts and schedules can be set up any way you need them to work for your business. Day Plans let you schedule staff for specific events and projects when you need employees with particular skills and skill levels. 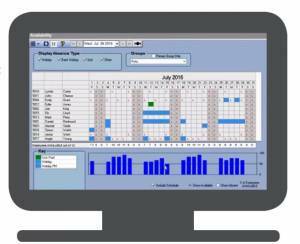 Our time and attendance software collects data using a range of clocking options. 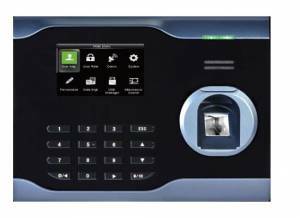 For example, customers with outdoor or dirty working environments often choose biometric hand or fingerprint terminals. For employees working on remote sites, smartphone clocking is an option. Whatever clocking methods you choose to use, the system seamlessly handles the accurate processing of the real time clocking data. The time and attendance software delivers a wide range of standard reports including payroll, absence, lateness, Bradford Factor analysis and fire roll call. 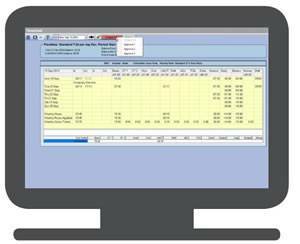 Custom reports are also easy to set up to meet the specific needs of your organisation. Your company’s wage bill reflects work actually done and costs are transparent. Employees are paid fairly for the work they do. Time is saved on payroll, rota planning and HR admin. Organisations can demonstrate compliance with working time and other regulations. Real time reporting ensures the right resources are in the right place at the right time – at the right cost. Chronologic delivers practical, cost-effective time and attendance solutions for customers in manufacturing, hospitality, healthcare and logistics across the UK. To find out more – call 01761 410015, email us or click chat to tell us what you’re looking for or to request an online demo. The system has given us the ability to keep a handle on a large number of employees, absences, target hours, sickness, banked hours and availability. Departmental information is now readily accessible for making key management decisions."